This mod adds an Elevator that will display a GUI to choose a floor to teleport to. Pick Floor GUI : Right clicking any elevator will display any Elevator above and below that is valid. A floor naming GUI : Simply sneak and right click the Elevator to open the Floor Naming GUI. 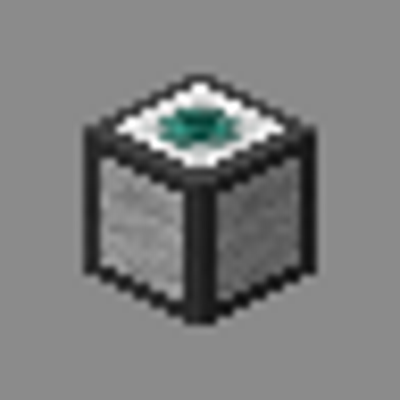 Rotating Teleport Locations : Depending on the way this block is facing (where the ender pearl is pointing at) the player will be teleported accordingly, if it is up then it places the player on top. if down it places the player 2 blocks under the Elevator. if it is on the sides then it teleports the player down one block on the side it is facing so the Elevator is at the head level. Hidden Floors : Elevators that receive a redstone signal directly, like a lever on the side or redstone next to the block, will keep the Elevator from showing up on the GUI, however the player can still use the Elevator to teleport. Floor Limit: There is a limit to the number of floors each Elevator can have. The Limit is 24 due to the GUI. Colorful: Now there are 16 colors of Elevators, each can be made using any elevator and the dye of your choice, or by right clicking an elevator with the desired color. Advanced Elevator: Right clicking an Elevator with a diamond will make it into an Advanced Elevator. if the player right clicks while sneaking it will open a menu to select 3 options, Rename, Camouflage, and Whitelist. When the Advanced Elevator is broken it drops a normal Elevator and a Diamond. 1) it cant be another Elevator. 2) it must be a normal block, like cobblestone, dirt, etc. and not be things like chests, and iron bars. 3) it must not be on the blacklist set in the config. Whitelist: Select the Whitelist option in the Advanced Elevator. You can type usernames and add them to the whitelist. To remove the names, click on them and hit delete. If enabled in the config only players who are on this list can teleport to it. Change Floors: You can change what floor you are on by jumping on/under/infront of an elevator to go up, and crouching to go down. Current Floor Messages: When you arrive at a new floor the Elevator will send a message to your player, letting you know what the name of the floor you are now on is. ex (Current Floor: Floor 1). View Whitelist: Using a stick on the Advanced Elevator will print into the chat the players whitelisted on the selected Elevator. Sound: The Elevator now plays a sound when the player is teleported to different floors. Modpacks and Servers: You may use this mod for any modpacks or servers, just have a link to this page and give credit where credit is due. Enjoy! I must apologize for not updating this recently, Life has been hectic and between college classes, my job, and dealing with moving houses and handling family matters I havent had much time to myself. I will be making the updates for this mod all the way to 1.12 (as long as I have the time) I will start updating for 1.9 tomorrow and go from there. Thanks for being patient! Thank you for making a very useful mod!! Just found this mod. Loving it. I cannot descend via the Sneak key when on an elevator. Just figured I'd drop a friendly note to let you know I'll be using this mod at CityCraft and will have linked to this page in the FAQ topic dedicated to listing the mods we use. Thank you SO much for letting me know! I will take a look and will add the modpack to a list at the bottom of the page to let others know! I am now aware of a few issues with the ported releases of the elevators and will work on fixing bugs that have surfaced, if you have any bugs or issues with any version please let me know. Sorry for the late response, sadly there is no tutorial atm, just a list of features. you only need to place the elevators on the same x and z coords, and make sure that the elevators have space to put the player. Could you add permissions so we can perfectly use it on a Cauldron / Thermos server with PermissionsEX? Does it not work on the server? what do you mean 'perfectly work'? I will try to get it working but I just need to know what permissions you want and why lol. It works absolutely like a charm! Permissions would help a lot with user management. Examples: Who is allowed to use teleport, who who is allowed to craft teleport stuff and something like that. I don't know how much time you have but there's another awesome mod with real elevators. The 1.7 version ist absolutely incomplete and misses nearly alle the good feature of the current versions. The author won't backport the mod. I thought it would be a nice idea IF you could take a look at it? If so, we would have to mods for different scenarios. Well I will check on the permissons and take a look at the mod, maybe I can work on something lol. I am also working on getting this out for 1.8.9 and 1.9 and 1.10 and 1.11 but i cant get the camo thing to work atm so i may just disable that and put out a beta build for them all. If the primary functionality is working, the camo can be added when it's ready. I am nearly finished with the 1.8.9 version of the mod. Once that is done I will then work on the 1.9, 1.10 and 1.11 versions. I am also working to add a way to make the Elevator emit light when glowstone dust is added to it. that is a WIP and currently does not work. If you have any issues, let me know here in the comments, or if it is crashing please make in issue here so that I can fix it. If you have Ideas on other features I am open to them. Hope you all are enjoying my Elevators! The current version of this mod, 1.7, still has some print methods, i uploaded a new version that doesnt have them. Sorry for any issues. Can the source code of this mod be found somewhere, preferably on github? Or is it closed source? I think it would be a useful feature if you could teleport to the next higher/lower elevator block in the ground by jumping/sneaking on the elevators, much like OpenBlocks does it with their elevator blocks.